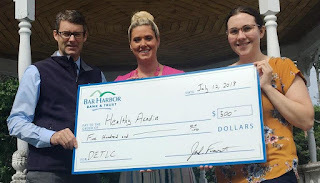 Jack Frost and Chelsea Sawyer from Bar Harbor Bank & Trust present a donation check to Katie Freedman of Healthy Acadia. These funds will provide scholarships for students in Washington County to attend the DownEast Teen Leadership Camp this summer, helping to make DETLC accessible to all youth. DownEast Teen Leadership Camp (DETLC) is an annual 5-day residential summer camp program serving primarily Washington County teens entering grades 7 to 9. Hosted by Healthy Acadia and held at the University of Maine at Machias, the camp challenges and empowers teens to make healthy choices and positively impact their lives and those in their communities. DETLC provides youth with social, communication and leadership skills to promote resiliency and to deter misuse of substances, including tobacco, alcohol and other drugs. DETLC is deeply impactful for the youth who participate, in terms of their opportunity to have a positive summer experience, the knowledge and tools they gain to make healthy choices, as well as the leadership skills they develop during camp and build on throughout the following years through an ongoing school-based programming. Since 2000, DETLC has motivated and inspired over 425 adolescents from rural Washington County and beyond to live substance free and serve as positive role models and inspiring civic leaders in their schools and communities ultimately increasing their personal well-being and workforce preparedness as they age into adulthood.DETLC has typically attracted more than 25 teens each year and recent enrollment has nearly doubled, with 49 teens attending in 2017. The DETLC model assures that all interested youth are welcome to attend camp, regardless of their ability to pay. For more information, contact Healthy Acadia at 207-255-3741.